Lunch daily, Dinner Wed., Sun. & Mon. : Hau Tree at the Mauna Kea Beach Hotel has a prime location just off the sand with views of Kauna'oa Bay. 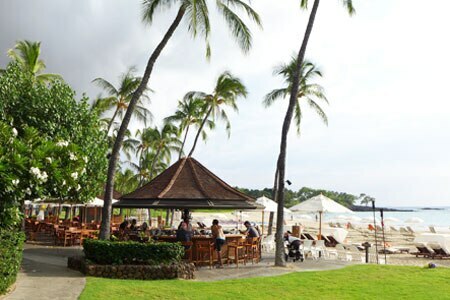 Have a Mai Tai at the bar or enjoy a full meal at one of the wooden tables sheltered by umbrellas. Menu options range from a seared ahi poke wrap to a Big Island beef burger to grilled mahi mahi.